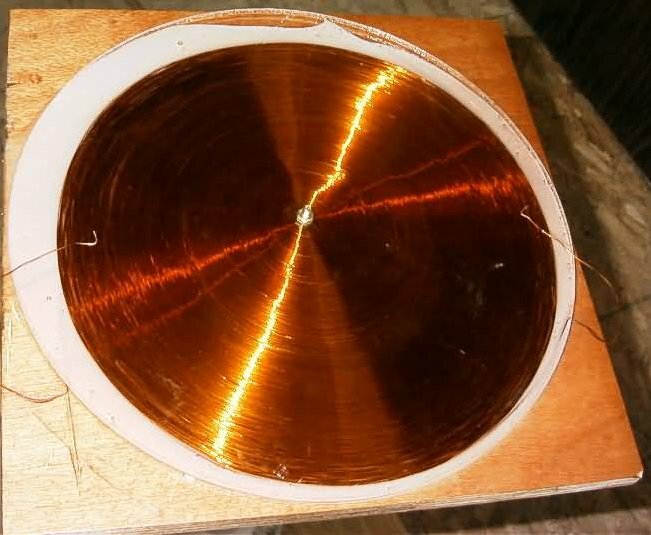 There are three wires wound in parallel on this coil. Three wires form separate ground leads at the perimeter of the coil and are joined at the center for a single terminal lead. 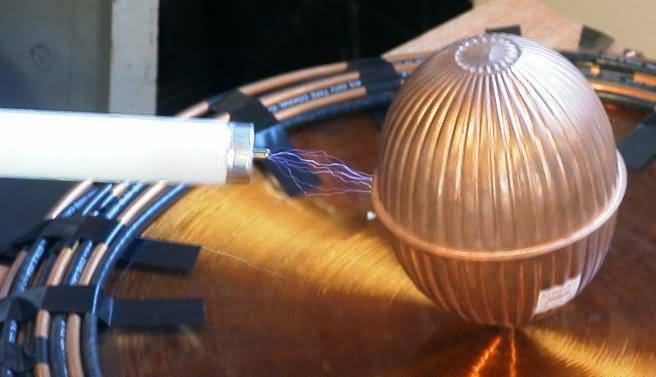 My purpose for winding this coil was to produce a rotating magnetic field in my alternative energy experiments; similar to the vortex J.L. Naudin was working with. 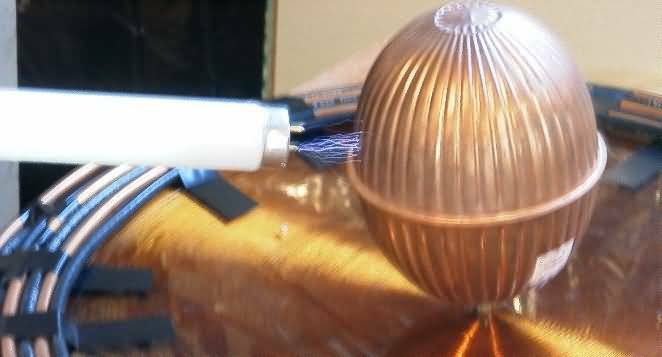 After not having any luck with the pulsed trigger in the schematics above I sought to trigger the wye coil with a Tesla primary coil. My thought was that by connecting the three wires from the wye coil to the ends and middle of the primary I might get an oscillating magnetic field in the wye coil. 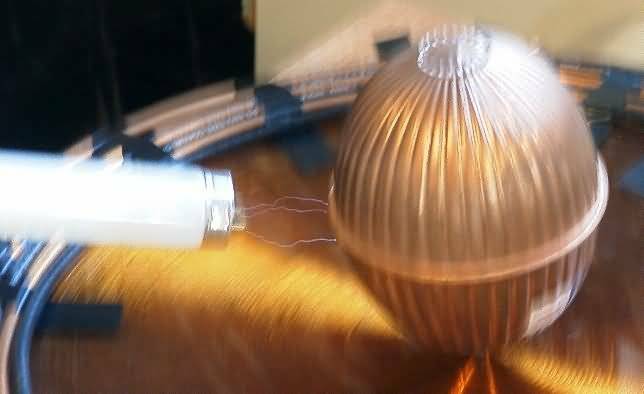 As seen in the photo below, I made the connections for a standard Tesla coil using a single thoriated tungsten spark gap, 15KV NST, six .324 mica caps connected in series and 3.75 turns of ¼” copper tubing for my primary circuit. I tapped the primary at both extremes of the tubing to start with. The secondary winding was connected to the same extreme points as the primary plus the third wire was connected to the calculated middle of the primary tubing. The terminal was allowed to operate with no load and then with a copper ball. 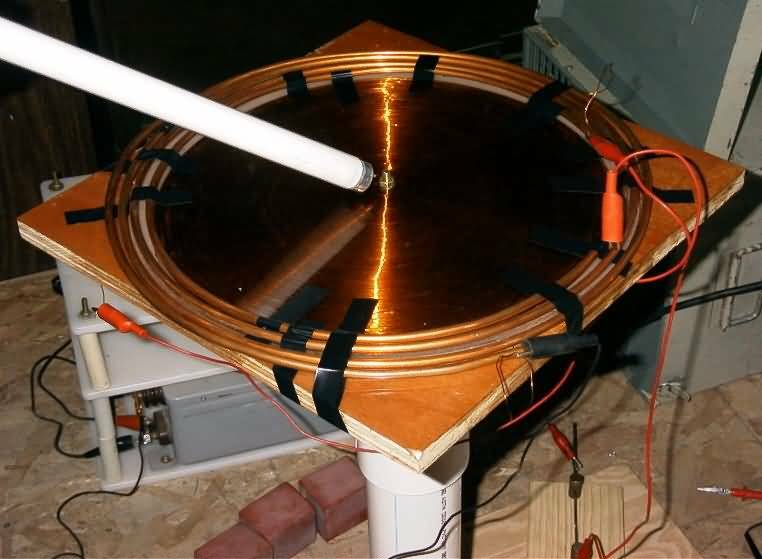 Before assembling the coil in this manner, I tested the wye coil for its resonating frequency using a digital 20MHz oscilloscope and an audio frequency generator. 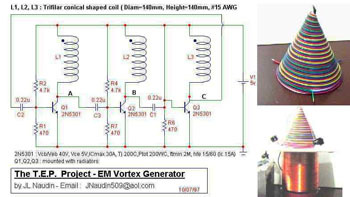 The resonant peak for this coil extended from 50KHz to 100KHz, a very wide range. I checked this several times and the results were the same each time. I measured the inductance of each coil at 6.20mH, 6.23mH, and 6.25mH. The resistance of each coil was about 5.1Ohms. 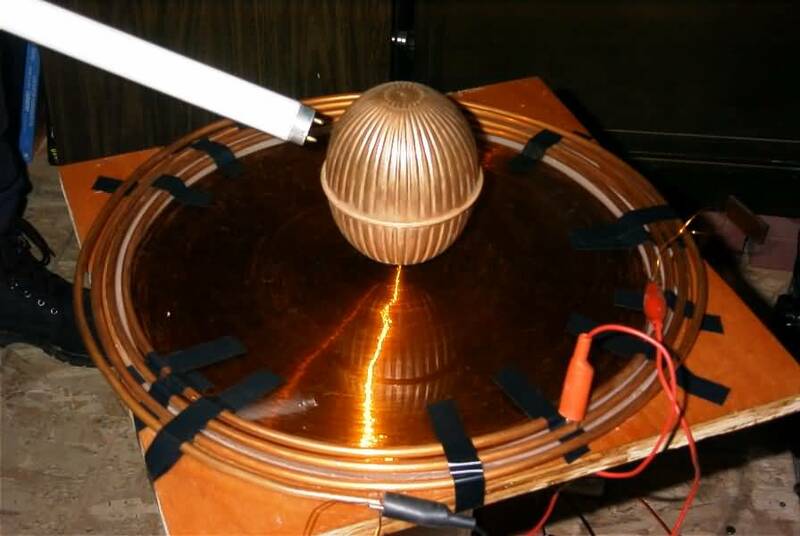 The diameter of the coil is 13.75” and is wound with three strands of 21-gage wire, joined at the center of the coil. I assumed that if the resonant frequency range were correct, then it would be easy to oscillate this coil. 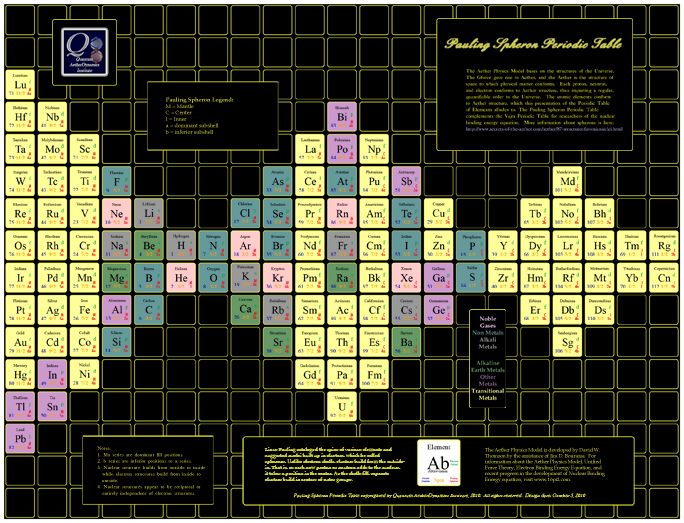 It did seem plausible that the wye coil configuration was responsible for the wide resonance frequency range. So when choosing the values for the primary capacitor and primary inductance, I used what was readily available and figured I could tune later. When the system was powered up I saw the spark across the spark gap, but something seemed amiss. It almost appeared as though I wasn’t getting anything other than a short circuit across the gap. After a few moments it occurred to me why I thought this. 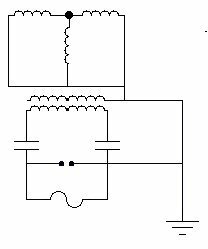 The spark gap was only barely audible in contrast to the loud hissing noise usually accompanying a disruptive spark gap. I brought a neon tube near the bare terminal of the coil and there were sparks. The sparks were up to 1.5” in length. I thought this pretty good for a system not tuned. Another great advantage of this coil arrangement was that the transformer, capacitors, spark gap and secondary all worked at cool temperatures. There was no usual heating to any of the components even after several minutes of continuous operation. This alone is sufficient evidence of the efficiency of this coil design. I’m beginning to see it’s potential as a power supply for lasers, MRI’s, ultrasonic cleaners, and other devices requiring high voltages. More experiments with this coil will follow in the coming days. I will attempt to fine tune and try to get larger sparks. I will also continue to look for the vortex I originally sought. 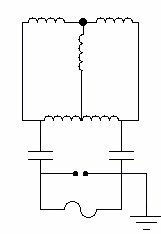 Today I calculated the capacitance necessary to ring the primary circuit at between 50KHz and 100KHz. 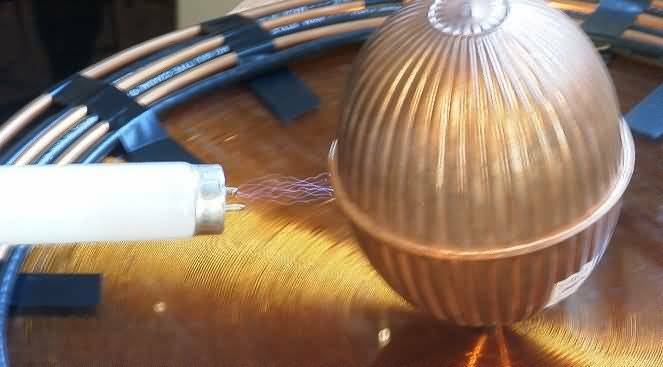 The primary inductance on just the copper coil was 12.0µH and for the copper coil with wires to the capacitors the inductance was 15.3µH. Using one capacitor bank of six .324µF to make .054µF capacitance and connecting this in parallel with a .051µF capacitor to get .105µF this would put the primary resonance at around 125KHz. On trying the system, I could not get enough energy to ignite the spark gap. In an attempt at finding out whether or not my measurement of the resonant frequency was correct, I connected all the capacitors in series to come up with .026µF and thus increased the resonant frequency to 252KHz. This produced sparks of about 1.5 inches. 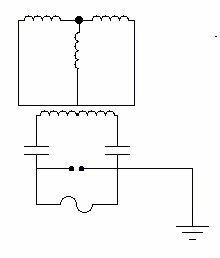 Then, noticing I had two capacitors of very similar capacitance, I rearranged the circuit such that the spark gap was parallel to the NST and split the capacitance between the two lines feeding the primary coil. 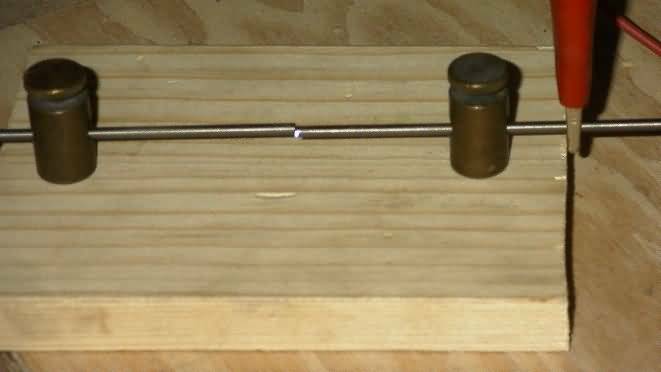 I also placed a strong magnetic field around the spark gap using two large NIB magnets. The ground was connected to one side of the spark gap. The coil put out about 3 to 4 inches of spark between the terminal capacitor and a fluorescent tube I was holding. Unlike previous experiments, I could clearly feel the high frequency electricity flowing through my hand and arm. Also, unlike previous experiments my computer speakers output a tremendous amount of noise, even though the spark gap was quiet. I tried connecting the ground to the center tap of the secondary coil, but the spark gap wouldn’t ignite under this condition. When connecting a ground in proximity to the terminal capacitance to obtain a spark, I get a fairly good spark (about 5”) but then the feedback shuts down the spark gap. If the ground is removed, the oscillations will eventually startup again. Continuing with the split capacitor layout and getting 3” sparks to the fluorescent tube I brought the tube a little too close to the terminal capacitance and the spark gap extinguished again. I decided to try the experiment again without the terminal capacitance to see the effect. 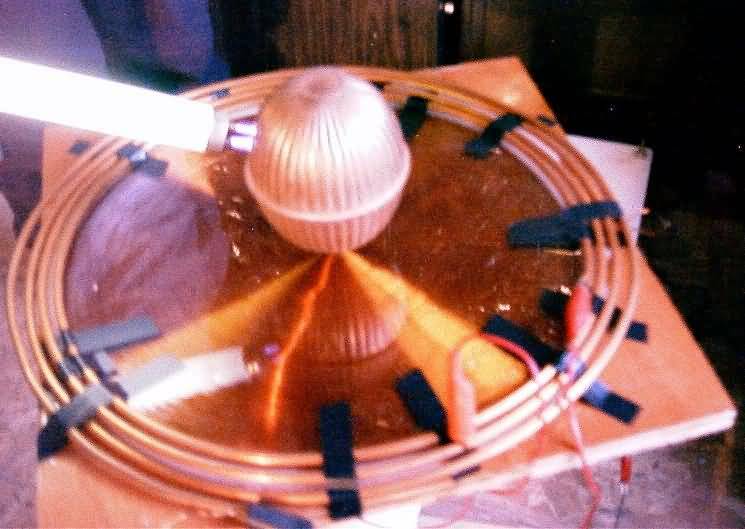 The spark gap was still extinguished when I brought the power up so I touched the center of the secondary coil with the fluorescent tube a few times. On the third touch the spark gap happened to come to life and a high frequency current went through my body with enough energy to noticeably burn the left side of my left foot (furthest away from the coil) as it sought a ground through my bare wood floor. I could only feel the current in my hand and as it exited my foot and there was no noticeable sensation in between. I’m now curious just how much power is coming out of the center of the secondary. I need to find a way to measure this. As an afterthought, I decided to run the coil with the magnetically quenched spark gap and then with exact same spacing but without the magnets. Not only did the coil produce brighter and stronger sparks with the magnetically quenched gap, but the spark length and intensity of secondary output actually increased over time. The further I brought the tube away from the center of the secondary, the more energy would build up to reach the tube. And the sparks would continue to shoot out at that distance. Further, the intensity of the charge between the tube and the secondary appeared to increase with time as well. 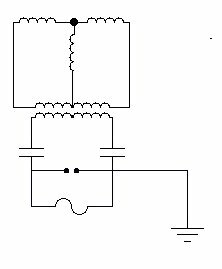 Noting that the direct coupling might be preventing the resonant rise I would like to see, I wound another primary, parallel to the copper tubing. I wound this coil out of RG 59/U coax cable. Even though the secondary was not grounded and the leads were not connected to each other, I was seeing 2.5” sparks between the terminal capacitance and a fluorescent tube. At this point, the extra primary winding was not connected to anything. When the system was allowed to run with no load on the terminal for about 30 seconds and then the fluorescent tube was brought near a spark of 5” would shoot across. Both during the loading of the terminal with the fluorescent tube and without, occasional sparks were seen jumping from the extra primary coil to the terminal across the top of the Plexiglas. These sparks appeared to build in intensity the longer the coil operated. The results were not much different from the previous experiment. It is important to remember that in all these experiments there is inductive coupling between the primary and secondary. 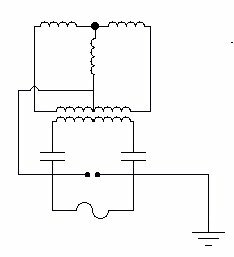 The schematics only show the nature of the direct connection, but not of the coupling. The sparks gained in intensity and length. The number of streamers is still abundant, but the length is shorter than last time. Not only are the streamers longer, but now there are streamers breaking out across the top of the coil from the extra primary (copper tube) to the center of the secondary. One such streamer can barely be seen in the above photo just below the fluorescent tube and at the top corner of the black tape. The streamers were much brighter and appeared to cross the full radius of the secondary in actuality. Also there was a noticeable shock coming through the fluorescent tube into my hand. The sparks were similar in appearance to the center tapped ground as seen in the previous arrangement, but the sparks through my arm were negligible. When the secondary was connected with all three leads to one side of the extra primary, as below, the results were negative. 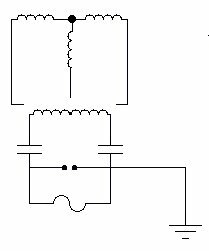 The spark gap would not stay lit and the extra primary shorted to the secondary. The above configuration worked just as well as the previous configuration where both grounds were connected to the same side. 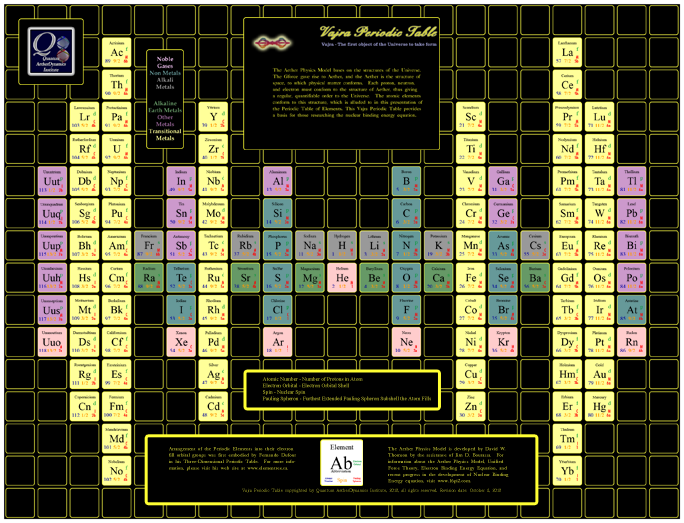 All the above experiments were conducted on a circuit that was not properly tuned for maximum resonance. 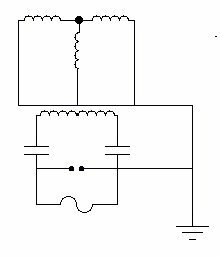 It is assumed that a properly tuned circuit with a more efficient spark gap would produce greater spark lengths. 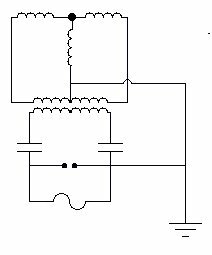 But the above circuits to show how the configuration affects performance. I needed a reference point for figuring the coil resonance. So I calculated the total wire length of the coil at 434.6ft. This is based on a 13.75” total diameter coil with a ¼” machine screw as the inside diameter. The quarterwave resonance for this length of wire is 565.571Khz. Using the primary inductance of the copper tubing at 15.5µH I calculated the total primary capacitance at .005µF. When replacing the .05µF capacitors from above with .01µF capacitors, I get the .005µF capacitance. When I fired up the coil I only got about 1/8” spark from the secondary when the fluorescent tube was held to it. Connecting to .01µF capacitors in parallel and then using these two sets of capacitors in series to end up with .01µF, I received about ½” sparks from the secondary terminal. 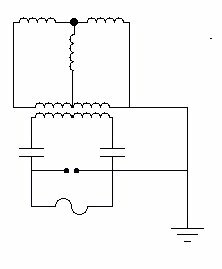 It is apparent that the coil resonates at a fairly low frequency, probably close to the measurements taken with the oscilloscope and frequency generator. When I connected two .324µF capacitors in the circuit to get .162µF, the 15KV 60mA NST could not push the circuit. I’ll have to look into more power or set the gaps tighter. Tightening the gap didn’t help. Tomorrow I’ll check to see if I have a stronger transformer. I couldn’t find my power transformer so I continued working with the 15KV NST. Today I experimented by connecting the center tapped secondary wire straight to ground, without center tapping the extra primary. The sparks were the same either way, indicating that there was no action taking place in the center tapped wire. This makes perfect sense, as the voltage in the center of the primary is zero. So I removed the black coax cable and returned to the copper tube as the sole primary for the coil. All three secondary leads were connected strait to ground as below. This is the same plan I used near the beginning. 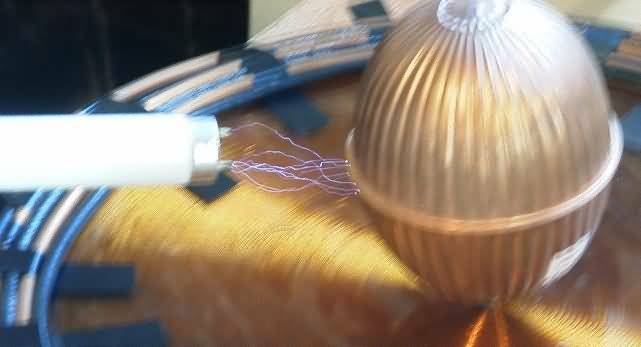 It works fine; puts out a strong electrostatic charge. Using this layout I was able to test tune the primary by changing the taps. About one and three quarters turns of the primary (4.3µH) seemed to work best. With the two capacitors having a combined capacitance of .026µF, the resonant frequency of the coil is about 476KHz.